Travelzoo.com is one of the websites that I check on a regular basis for the best air and vacation deals. They are a trusted publisher of travel, entertainment and local deals with over 26 million email subscribers worldwide! I highly recommend you sign-up for a free account to get full access to their website and receive their famous Travelzoo Top 20 Deals List (weekly email), Newsflash and Local Deals alerts. I enjoy getting Travelzoo’s weekly Top 20 List and seeing what’s on it. I’ve purchased many deals from the list in the last couple years. The Travelzoo Top 20 is the definitive list of the week’s best travel, entertainment and local deals. Every week, our team of more than 250 Deal Experts in 25 offices around the world research, evaluate and recommend the hundreds of airfare, hotel, vacation package, cruise, rental car, entertainment and local deals. Only the most competitive make the Top 20. Our Test Booking Center confirms the accuracy and availability of every deal before the list goes out. Click here to sign-up for a free Travelzoo account to get free access to all of their deals. 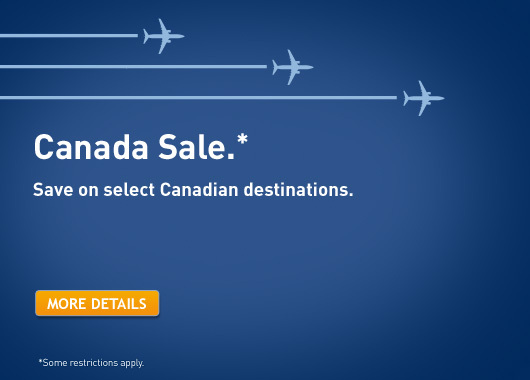 WestJet is having a Canada Seat Sale. You can save on flights to select Canadian destinations if you book by October 10, 2013 (11:59 p.m. MT) for travel until February 12, 2014 on select days. How to get this deal: For Canadian destinations travel on Tuesdays, Wednesdays and Thursdays. Offer limited and subject to availability. Click here to book a flight on WestJet.com now or for more details. If you need to book a hotel, check out Hotwire.com, Hotels.com, and Priceline.com. These are the 3 websites I use to book hotel rooms. If you’re looking for a nice and affordable getaway, check Groupon‘s deal to the Holiday Inn Canmore, AB. This is a limited 11-day only sale that will expire at midnight on Wednesday, October 16, 2013. Click here to buy now or for more information about the deal. Quantities are limited so don’t miss out! WestJet is having a 32-Hour Pink Tag Seat Sale where you can save an extra 30% off selection U.S., Mexico and Caribbean destinations! You’ll need to enter the Promo Code WJC73 and Coupon code NKXZHGK for bookings by October 4, 2013 (9:59 p.m. MT) for travel on select days from October 16 – December 11, 2013. WestJet is a proud supporter of the Canadin Breast Cancer Foundation. How to get this offer: To redeem this offer, bookings must be made on westjet.com. Both the promo code and coupon code are required at time of booking on the first page of the booking process. Discount can only be applied towards fares displayed in the Econo category. Percentage is applied to base fare excluding taxes, fees and charges. Discount cannot be used towards the purchase of a WestJet Vacations package. 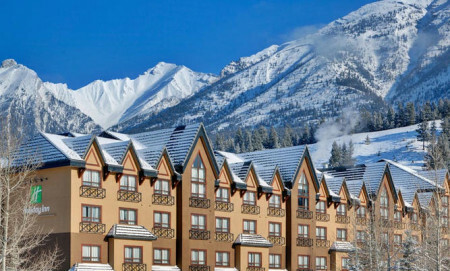 Hotels.com wants to show their appreciation for customers in Canada and the US by offering up to 40% savings at top cities, plus the opportunity to earn up $20 on your next hotel stay! You must book by October 7, 2013 for travel until October 21, 2013. Click here to book a room in Canada on Hotels.com or for more details. Click here to book a room in the US on Hotels.com or for more details. WestJet is having a Canada Seat Sale. You can save on flights to select Canadian destinations if you book by September 26, 2013 (11:59 p.m. MT) for travel until February 12, 2014 on select days. 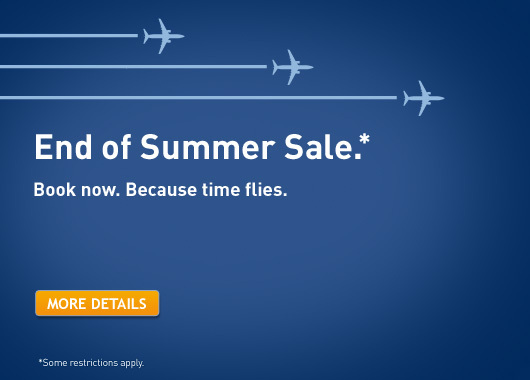 WestJet is having a End of Summer Seat Sale. You can save on flights to select Canadian, U.S., Mexico and Caribbean destinations if you book by September 19, 2013 (11:59 p.m. MT) for travel until February 12, 2014 on select days. For Canadian destinations travel on Tuesdays, Wednesdays and Thursdays. Offer limited and subject to availability. For U.S. destinations travel on Tuesdays, Wednesdays and Thursdays. Offer limited and subject to availability. For Mexico and Caribbean destinations travel on any day of the week where WestJet offers scheduled service. Expedia.ca is having a Vegas Sale! You can save up to 50% off select Vegas hotels and packages if you book by October 31, 2013 for travel until March 31, 2014! More Canadians book their trips to Las Vegas on Expedia.ca than any other online travel agency. All bookings are all backed by Expedia.ca Best Price Guarantee. Don’t forget to check out my Vegas blog “JustVegasDeals.com” for all the best and hottest deals in Vegas! You’ll find lots of hot deals and great travel tips. Click here to shop Expedia.ca now or for more details. 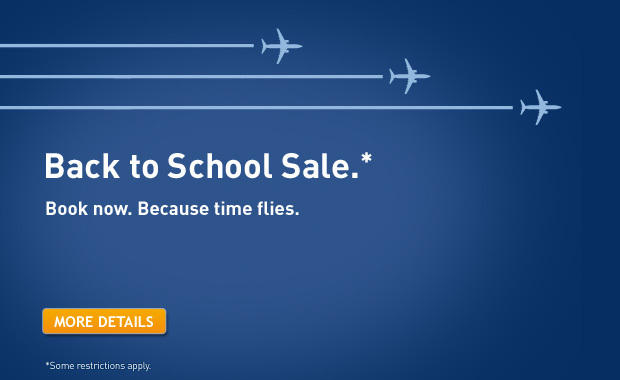 WestJet is having a Back to School Seat Sale. You can save on flights to select Canadian, U.S., Mexico and Caribbean destinations if you book by September 9, 2013 (11:59 p.m. MT) for travel until February 5, 2014 on select days. For flights to Canadian and U.S. destinations, travel on Tuesdays, Wednesdays, Thursdays and Saturdays. For flights to Mexico and Caribbean destinations, travel on any day of the week where WestJet offers scheduled service.